Gray foxes are a unique species of fox, very different and more cat-like than other foxes. Kits are usually born in late spring and have a dark gray or brown wooly coat. After a few months they exchange their wooly fur for their coarse salt and pepper hair. They also have a white chest and belly with red accents and a black stripe running down their tail. Most have a black-tipped tail. Their single layer coat means less shedding than red foxes but it also means they are more susceptible to extreme cold and heat. Adults reach an average weight 4-12 pounds and are about the size of a large housecat or small dog. This is a primitive canid species not considered a "true" fox like reds, arctics, and fennecs. They lack the violet gland that gives other species their trademark unpleasant smell. Due to this fact, as well as their overall personality and behavior, I believe that this is the best species of fox for a house pet. like hay and fresh cut grass. They are especially intrigued by old bird nests, picking them apart piece by piece and sniffing each little bit. They will also eat some types of fresh and dead leaves so make sure there are no toxic plants nearby. Though a more primitive species than the red fox, grays are still quite intelligent. Mine know how to open the door latch so I have to secure it with a pad lock. Remember, this species of fox primarily lives in trees in the wild. Make sure the outdoor enclosure has shady areas. 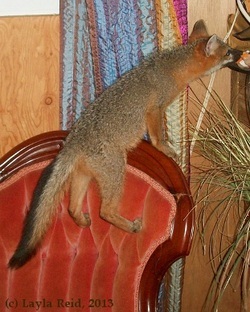 Gray foxes love to climb! Tree stumps, logs, drift wood, branches, things like these inside the enclosure are virtually necessities to keep your fox happy. Do not use fake/silk trees, painted or treated lumber, or anything that might have been sprayed with pesticides as they have a tendency to eat the wood. A den box is another necessity. This can simply be a dog house or something similar, just to give them a place to feel secure and get out of the weather. I have a custom built three story slightly angled den box for my grays. This way they can see out from different levels and they love to run up the sides. Indoors they will climb as well. They will climb everything! From curtains to aquariums to chase the fish and TVs to attack the moving pictures. So give him or her appropriate things to climb. I like cat trees with attached spring toys to give them something to climb and attack. Make sure to supervise your fox and teach her what's ok and not ok to climb. Teach the word "no" and, if needed, use a squirt bottle for a training aid. Whether indoors or out, grays seem to have a natural tendency to use the bathroom in only one spot. This usually makes them fairly easy to litter box train. For grays, you can use a cat litter box or similar small flat container. There is additional information on the general fox care page. feeding Grays can be fed the same diet as any other fox but I've found they don't seem to like meat as much. They usually prefer fruits, veggies, and bugs. Remember to avoid toxic foods such as raisins, grapes, onions, tomatoes, avocadoes, and pork. Blackberries are a major favorite. Also strawberries, blueberries, carrots, watermelon, and pineapple are good choices. Feed sugary foods sparingly though. Good bugs for foxes are crickets, grasshoppers, and captive bred roaches such as Madagascar hissing cockroaches. They also seem to like shrimp and crawdads. Since gray foxes have a tendency to mark their territory and property with the scent gland behind the ears instead of by urinating, you will usually be just fine giving their food and water in standard dog dishes. They do like to scavenge so hiding or scattering a few pieces will give them some entertainment. Remember, each fox is a unique individual, just like we are. These are generalizations and won't necessarily apply to every gray fox. They are the only fox and one of only two species of dogs that climb trees. Grays sometimes live in small social groups in the wild. They have sharp semi-retractable claws sort of like a cat. A gray fox is not actually gray. Their fur is made up of coarse individual hairs each with its own pattern of salt and pepper markings. When the hairs are seen together on the fox it gives the appearance of a gray animal. Their patches of solid white and red fur have a different texture than their salt and pepper fur. It is soft and plush to the touch, more like a red fox. These amazing foxes and their close cousins, the island fox, are the last remaining members of the genus Urocyon. One species of Urocyon, the Cozumel Fox, disappeared as recently as 2001. 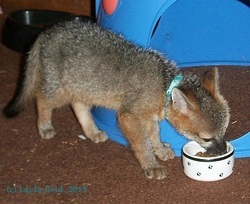 Sadly, the island fox is critically endangered because of disease brought to their homes by humans and dogs. 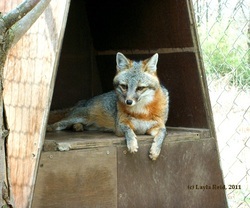 The mainland North American gray fox's numbers are also declining due to habitat loss and climate change.